A richly flavorful with mellow pungency Creole garlic. Harvests early summer - stores through winter into mid-spring. Know for sure where your food comes from - buy direct from our growers below and save. Burgundy is as beautiful a garlic as the name implies. The Creole group may well be the most beautiful of all garlics for more than one reason. Botanists once thought Creoles were a branch of Silverskins but It was hard to believe Creoles were Silverskins as they don't resemble any Silverskins in any way. Botanists assured us; however, that they were genetically Silverskins, but the latest DNA studies show not to be so. They are in an class all of their own and it shows. If I have a personal favorite garlic, this one is it. I love so many of them it is hard to pick a single one, but I could not leave these beauties off any list of favorites. They look almost too pretty to eat-until you try one, then you realize they're too beautiful not to eat. 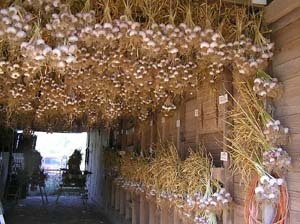 The size all Creole garlics grow to depends on where they grow as they require as much direct overhead sunlight as they can get. Most of them have grown in the Caribbean area the last 500 years and they get real big when grown down South but rather small when grown in the north because they cannot get the intense sunlight they need. You might want to buy a handful of these garlics even if you hate garlic; they make a fabulous centerpiece for the festive table.